It’s not a taco, it’s not a burrito. It’s the best of both. And it’s fun and pretty! This is an easy “go-to” lunch because you can keep many of the elements on hand in your freezer. I always have taco meat, refried beans, and Mexican cheese blend in my freezer. And we almost always have everything else except maybe not the salsa. But these would be good even without the salsa. These would be fun for the kids to help with because there is very little cooking and mostly layering. All those years of making you a meal out of play dough could finally pay off. And, since they helped make it, maybe they’ll eat it! I don’t know, it’s worth a try anyway. So it’s pretty much take a tortilla and layer all this yummy stuff on it. This is pretty healthy lunch; I hope you enjoy it! If using seasoning packet, follow directions. add seasonings to ground beef as it browns. Simmer until the onions are tender and seasonings have developed their flavor, about 10 minutes. Lay one flour tortilla on your cooking surface. 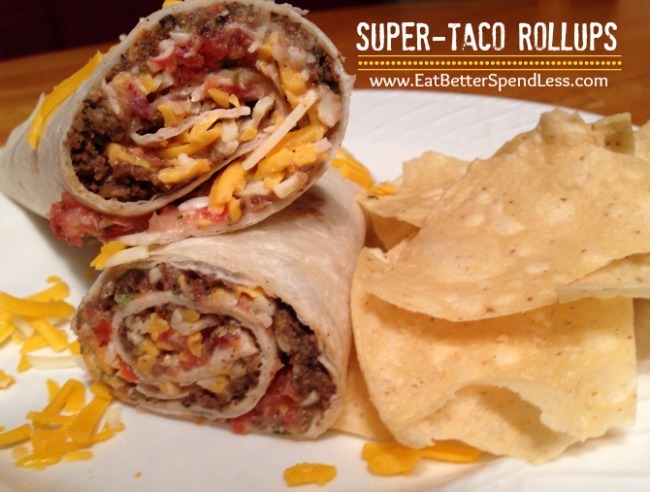 Roll the tortilla tightly, cut in half, enjoy with chips & salsa! Looks like my kind of meal! Easy, healthy & delicious! SO glad you shared. I will be making these for us this week. Yay! I hope you like them. Thanks for stopping by!